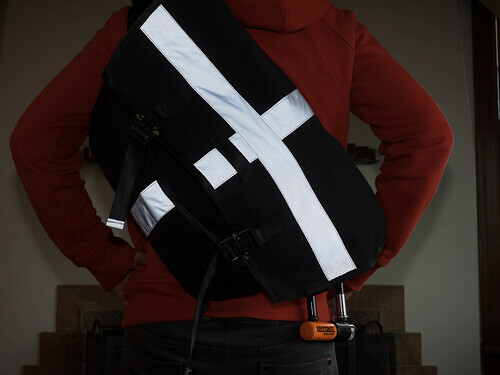 I’m taking a break from the regular programming of “funny kid stories” to geek out about something most readers won’t care about: Bicycle commuting bags. If this isn’t your thing, come back later. My one non-negotiable requirement for my commuting bags: They must be waterproof. The main thing I have to get back-and-forth is my laptop. This is Seattle, and water and electronics don’t mix. Other than that, my preferences have evolved over my two years commuting. I started with with panniers. My experience with panniers taught me my second criterion for evaluating a bike bag: How well does it work when off the bike? My commuting bag holds my stuff when I’m at my desk at work and when I’m at home, and it’s got to schlep my stuff to and from my bike as effectively as it carries my stuff when I pedal. All of the panniers I tried were awkward off the bike. Next up were the backpacks. Backpacks taught me another thing: I hate using velcro as the primary mechanism for keeping the bag closed. I used a Chrome backpack with a velcro-fastened roll-top for a while. It’s incredibly secure and it’s the best way to build a waterproof bag, but the rrriiippp each time I wanted to open the bag got on my nerves, especially in an otherwise quiet office. Next I got a buckle-fastened roll-top backpack: The Chrome Barrage. I love this backpack. Simple, durable, waterproof, carries tons of stuff, looks cool… and no velcro! I used it every day for months until I discovered its fatal flaw. I was in our basement one weekend playing my least favorite game of “where’s that cat pee smell coming from?” when I discovered the smell was coming from my backpack! It turns out the foam-padded panel they use to make the backpack comfortable when resting on your back soaks up sweat like a sponge. Nine months of sweating into it every day turned that padding into a stinky bacteria colony. It took me several washes to get the smell completely gone. I still have the backpack, but I’m afraid to use it as a daily commuting bag. It turns out there aren’t many “bike commuting backpacks” without padded foam back panels. So reluctantly I turned to messenger bags. Unless you were an actual bike messenger, using a messenger bag struck me as choosing style over practicality. Backpacks are easier to get on and off (you don’t have to lift them over your head), and the two straps hold the weight more securely while pedaling. But, messenger bags aren’t built with absorbent foam padding. I gave them a try. So, as a favor to The Internet, here’s a real user’s comparison of the most refined messenger bag on the market to the unknown newcomer. Top: Mission Workshop VX Rummy. Bottom: Defy Bags “Vicious” Cobra. Hardware: Straps, closure, velcro. The Mission Workshop bag is just perfect — beyond the gold standard. Platinum standard? The strap can go on either shoulder. 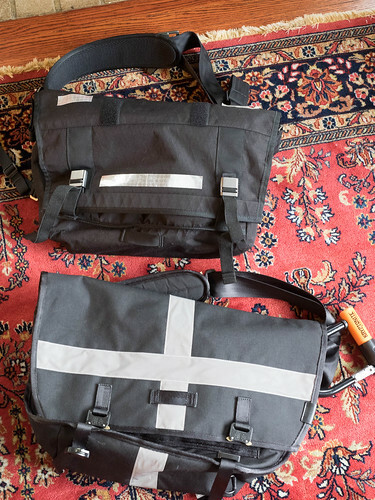 The Mission Workshop bag has a metal “quick adjust” system on the strap instead of a “quick release” system that works effortlessly. And the metal VX closures are also simple and effective. Also, while the Mission Workshop bag has a velcro roll-top, it’s completely optional. If you use the bag in its “flap-down” configuration, the only time you have to interact with velcro is using the accessory pockets, and I found that much less annoying than velcro over the main compartment. The Defy bag gets its cachet from the expensive and trendy Cobra buckles it uses on the strap and flap closure. These buckles look cool and I smile inside each time I hear them click closed. However, I’ve found them to be a little finicky to open. 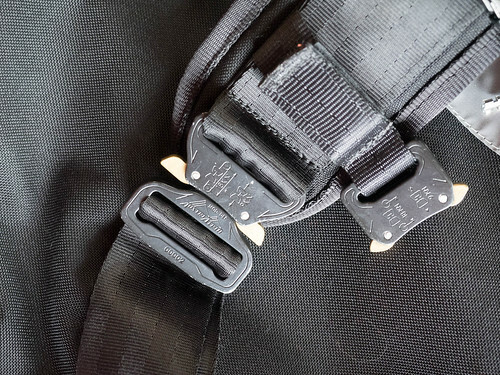 You can’t open them while under load, so the “quick-release” buckle on the strap is particularly tough to use. When I first got the bag, I wasn’t sure the quick-release buckle worked at all it was so hard to unfasten when I was wearing the bag. It took a lot of practice to perfect my little hop-grab-fidget-unfasten maneuver I do now. The Defy bag also has no quick-adjust mechanism at all. While the Defy bag looks cool, the Mission Workshop quick-adjust is so much nicer. The Cobra quick release on the strap, plus the optional Cobra stabilizer. The Vicious doesn’t need the stabilizer to stay put on my back, so I never use it. The Cobra buckles that hold the flap down are much easier to operate than the strap buckle — the flap isn’t under load the way the strap is. Here the hardware is as nice as what’s on the Mission Workshop bag. I have only one complaint about the Defy flap closure: Velcro! I don’t know why you design a bag with two awesome, expensive metal buckles to hold the flap down and also have velcro that I have to rriiippp open when I get to work. I solved this by ordering some two-inch industrial velcro from Amazon. I use it to completely cover the velcro on the inside of the flap so it no longer sticks to the bag body. Problem solved. Design. The Mission Workshop bag is straight and narrow. Access to the main compartment is surprisingly high on the flap — the design reminds me of a brown paper lunch bag. This provides great protection from water, even when you use the bag “flap down” rather than “roll top,” but the flip side is it feels kind of constricted to get into that main compartment. The accessory pockets are a great size and shape. The Defy bag, in contrast, is wide and tapered. When you flip that flap over, the main compartment yawns open at you. It’s incredibly easy to get to everything. I understand now why some non-messengers have been lifelong fans of the messenger bag; the ease of access is a revelation. While this design looks less waterproof than the Mission Workshop bag, in practice I’ve had no problem with water entering any of the compartments on my commute. The Defy bag also has lots of well-designed pockets to help organize smaller items. The real advantage of the wide-and-tapered design comes when wearing the bag. I find the Defy bag much more comfortable to wear; I think it’s because it’s distributing weight over a larger area of my back. And for some reason, the Mission Workshop bag always wants to slide down when I ride my bike — the extra stabilizer strap is a requirement for that bag. The Defy bag, in contrast, stays put. I don’t know if it’s the surface area, or the taper (the taper makes it feel like the bag hugs my back), or some other magic, but “stays put” is a huge advantage. Comfort on the bike, incredibly easy access to stuff when off the bike, no foam padding to absorb sweat: I grab the Defy Vicious for my daily commute. It’s not as refined as the Mission Workshop bag, specifically with the strap hardware, but for me it’s advantages outweigh its disadvantages. If you’re considering the Defy Vicious, just be willing to learn the hop-grab-fidget-unfasten dance and you’ll have a great bag. Bonus: The Defy Vicious comes in Model T black. While I’m a fan of muted colors, I feel safer with something reflective on my bags, so I usually trick out my bags with reflective tape. Even when bags have “reflective details,” I put on more reflective tape. I like living, and I grasp anything that increases my visibility on the road like a talisman. I planned reflective tape with the Vicious. So reflective! I love this. Why isn’t this a standard offering, Defy? Any further thoughts after a couple of weeks? I picked up a rummy, but I don’t necessarily love the awkward access and lack of pockets for pens and such — do the pockets on the vicious organize your life for the office pretty well? I’ve also got emergency bike supplies tucked away in different pockets… so yeah, it works well. Where do you normally carry your laptop? Do you think the stabilizer strap is unnecessary, really? Whoa, somehow missed this. I carry my laptop (15 inch Macbook) in a slim sleeve in the main compartment. The sleeve is to protect from scratches, not from drops. I absolutely don’t need the stabilizer strap — which is good, because the strap is kind of annoying. The only place to clip it is from the corner of the bag that’s lowest when slung over your shoulder (as opposed to an “armpit hugging” configuration from the higher corner). If you disconnect the strap when you’re done riding to walk around, it dangles down and hits your legs when you walk.